DHSU has been written for Skye DataHogs & MiniMets. Many Skye customers would like, or need to be able to view the weather data as it is being recorded. 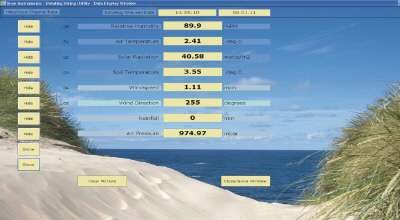 This utility has been written to provide a simple ‘live’ display of the weather data when a DataHog/MiniMet is connected to a PC, either directly or via a Mains Hog or Mains Hog with Signal Booster. The frequency of the update can be from 10 seconds to 12 hours, ie the logging interval choice of the DataHog. When the DataHog is connected to a Com Port on the PC, a ‘beep’ is heard. This is sent every 10 seconds. When the 10 second beep and the chosen logging interval match, a string of data from each channel is transmitted from the DataHog. DHSU is ‘listening’ to the Com Port. When the data is transmitted, the software ‘grabs’ the data & displays it on screen. The ‘captured’ data string is stored in a directory called SkyeDHSU. When the data string is replaced by the next string, it is transferred to a day file where all the data strings accumulate to become the archived data for that day. A new file is made for each day. The ‘Data Display’ screen is fully customisable – channel names, units, colours, etc. There is also another screen, again customisable, which gives cumulative totals. Please contact Skye for ordering details.